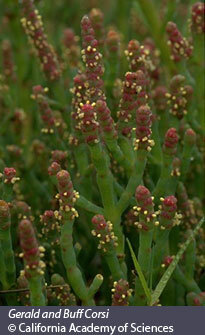 PLANTS: Plants found in estuaries need to be adapted to salty conditions. Having too much salt can kill many types of plants. Some plants, like pickle weed, can absorb the salt water and store the salt in special compartments, called vacuoles, in the leaves. This makes the plant taste very salty which may be one of the reasons it is called pickle weed. Can you see the other reason in this picture? Other plants, like salt grass and alkali heath, are able to push the salt out onto the surface of the leaves. The salt crystals can be seen if you look very closely. ANIMALS: Many types of animals are found in estuaries. In fact, the complex food web found in an estuary helps to support an amazing diversity of animals. The decaying plants are eaten by microorganisms (animals so tiny you need a microscope to see them.) The microorganisms are eaten by small invertebrates (animals without backbones.) Fish, like carp and stickleback, then eat the invertebrates. Many of the fish we eat depend upon estuaries. They are sheltered places where fish can have their young and the young fish can grow before moving out into the open ocean. Without estuaries, the number of fish in our oceans would decrease greatly. Occasionally, water in certain areas of the estuary can dry up and all that is left is a mud flat. It may seem like there is no life in this mud flat at all, but there are all kinds of mussels, shrimp, worms and other invertebrates living in the mud. Often you can see birds probing the mud with their beaks looking for a tasty meal. 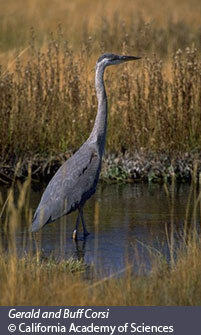 There are a large number of birds found in estuaries. The migrating birds such as geese use them to rest and feed. There are also birds who are permanent residents of the estuaries. Many of these birds, such as the Great Blue Heron, and the Great Egret, have long legs that they use for wading in the water. Egrets are excellent at hunting fish. Some wiggle their toes in the sand to attract fish, which they can snap up for a meal. If you look at the different types of birds, you will notice that they all have different lengths of bills. This means that each type of bird is adapted to eating different things. This reduces the amount of direct competition between the birds and allows more types of birds to live in the same area. People and Estuaries: Everyone wants to live near the ocean, right? Unfortunately, in order to build houses near the ocean, estuaries were drained and filled in with dirt so that houses could be built on top of them. Many of our estuaries were destroyed before people realized their value. Estuaries are valuable for a number of reasons. Many countries and coastal communities around the world rely mainly on fish as their primary source of protein. Estuaries help maintain fish populations in the ocean, and without them we would have fewer fish to eat. Estuaries are also natural water filters. They filter the river water that flows into them, helping to keep our ocean water clean and safe for everyone to enjoy. Another important service they provide is protection from large storms and hurricanes. Large waves caused by these storms can cause incredible amounts of damage when they come onshore. Estuaries create a natural barrier that absorbs the energy of the waves and prevents them from flooding cities, destroying houses and injuring people.